The Bradman Lake HS “Mini” carton and tray former has been introduced to the market due to an ever-increasing demand for carton forming machinery that occupies minimal floor space. Its compact footprint is nearly half the size of traditional carton formers, yet it retains the same valuable features found in the Bradman Lake HS Former design platform. These features include: forming rates up to 60 cartons/trays per minute, quick changeover, and an Allen-Bradley control platform. Every machine is supplied ready for production as a stand-alone unit or as an integrated piece of a Bradman Lake packaging system. Tooling Flexibility: The HS Mini can be tooled to erect different styles of lock and glue form cartons and trays, ranging from standard three flap or front flap cartons, turn-over-end cartons, to hooded lid cartons, as well as shelf ready display style cartons that include atypical shapes associated with seasonal products. Don’t see your carton design? Contact us to uncover the possibilities. The HS Mini is simply the perfect solution for limited floor space applications. Please contact us when you are ready to discuss your next project and let Bradman Lake put 70+ years of packaging automation experience to work for you. 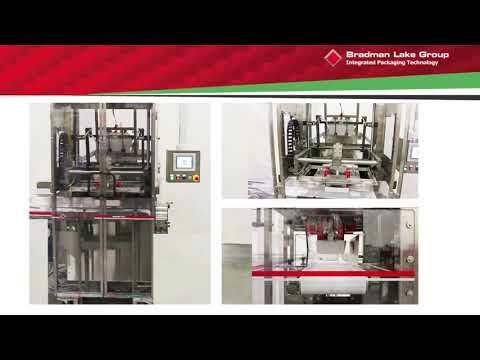 Established in 1948, the Bradman Lake Group is a leader in integrated packaging technology. From distribution and feeding systems, flow wrapping, roll wrapping, slicing, bagging, robotics, cartoning, to case packing, shrink wrapping and palletizing, Bradman Lake’s solution based approach is gained from thousands of installations around the world. Bradman Lake’s manufacturing plants are located in the UK and USA with regional sales offices in Russia, India and China. Bradman Lake is a wholly owned subsidiary of the multi-disciplined UK engineering group, Langley Holdings plc.